Thermal-transfer cryo labels for the identification of -196°C liquid nitrogen Dewar aluminum cryogenic canes for cryo tubes and cryo straws. Specifically designed to fit the top of the cryogenic cane for easy marking and identification inside Dewar-type liquid-nitrogen freezers and tanks. These specialty labels are made from a cryogenic material that has been tested and approved for applying to stainless steel and aluminum with subsequent immersion and storage inside liquid phase and vapor phase liquid nitrogen. The application of these labels to metal cryogenic canes is recommended at room temperature prior to immersing into liquid nitrogen Dewars. 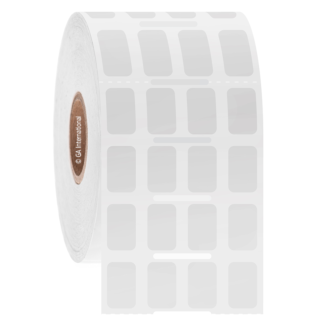 The MetaliTAG™ cryo cane labels can be provided in different colors and configurations, and can be printed with all major brands of thermal transfer printers.